Description: The Bourne Ultimatum movie mobile game: enter Bourne's frantic chase against time thanks to the official mobile game of the Bourne saga. Travel through 6 stunning environments from Moscow to New York City by going through London and Tangier. In this hand-to-hand combat and gun fighting action game, survive against 6 types of enemy and 3 different bosses. Go beyond the movie and go beyond the book being Bourne in the official mobile game of the Bourne saga. You finally have the power to set straight on Jason's real identity! 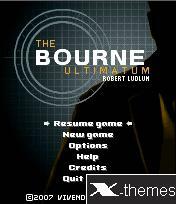 "The Bourne Ultimatum" interactive software (c) 2007 Vivendi Games, Inc. Published by Vivendi Games Mobile, a division of Vivendi Games Europe S.A. All rights reserved. "The Bourne Ultimatum" characters, events, story and publishing rights, (c) 1980 Estate of Robert Ludlum. All rights reserved.